Sitting on an Alitalia plane full of Italians hardly makes it any easier to collect my thoughts about Marco Simoncelli. We've witnessed a terrible thing in the accident that befell our favourite, tall, gangly, afro-haired Italian. Sunday was distressing for everyone involved in the sport. It has rocked MotoGP and motorcycle racing as a whole, for we've lost a true superstar. He may not have won a MotoGP race but you don't have to have racked up hundreds of wins to be a hero. For the fans he was just that, simply because they dreamed of being like him. The white-leathered rider on the #58 Gresini Honda polarised people, and for those of you who know how passionate I am about motorsport, you can guess which side of the fence I came down on. Simoncelli brought you to the edge of your seat whenever there was a battle out there on track. Throughout the 250cc victories of 2008 and 2009 I actually wasn't that moved either way by him. Crashing non-stop during his first few rides on a MotoGP bike in 2010 confirmed to me that he was a bit of a nut. My suspicions were compounded when he crashed twice in a single session at Laguna Seca and Brno. But then at Misano last year he turned a corner for me, and my opinion of him changed forever. Yes, OK, he crashed again in the race, but not before he had run assertively behind the 'aliens' – ahead of his bike's potential. I can remember the exact moment, while commentating on the television, that it struck me that Simoncelli had arrived. This year he got a coveted HRC works deal with Gresini in only his second year in the class. Honda had seen something that others hadn't and it wasn't going to miss out. Marco fought like hell to be up at the front, fearless as he carried his sweeping speed into corners. Then there was Le Mans, and that clash with Dani Pedrosa. The MotoGP world was split. The senior riders on the tour took one position: that the Italian was dangerous and needed to calm down. Simoncelli, meanwhile, and his growing legion of fans, took quite another. Before that day was out some said I was part of the Marco Simoncelli fanclub after the comments I made on air in support of him. I was. And I told the man himself as much at the back of the Gresini garage that very afternoon before he'd even got out of his leathers. For here was a racer. Quick but chancy with it. The sort of man the sport not only thrives on, but needs for its very survival. Shaking his hand in the paddock after he took pole position at the next race at Barcelona - his first pole in MotoGP - is a memory I shall cherish. And he did it in the naysayers' back yard too. 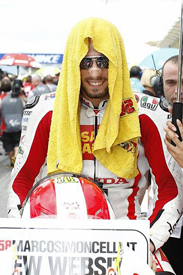 The witchhunt Simoncelli endured after the French MotoGP was, looking back on it, deplorable. It was as if those others criticising him had never crashed a motorcycle as they learned to ride at the top level. But he listened anyway, took on board the comments and calmed his approach down. As the summer went on, Marco won through the flack, as fans began turning up to races with as many #58 shirts and flags as I've ever seen. There was one banner in the grandstand opposite the pits at Silverstone in particular that summed up the groundswell of opinion behind Simoncelli. 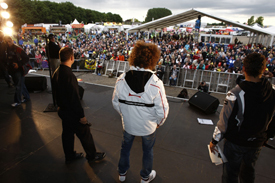 I can't remember what it said, but I do recall the guys in their afro-Simoncelli wigs waving it all weekend. Everybody saw it in the MotoGP paddock and it struck a chord not just with me. The fans had a new name to get behind. You can't fool the fans for long, and they'd decided in their droves that Marco was the guy they wanted to shout for while Valentino Rossi was in the doldrums. By now I was a #58 fan through and through. Here was a rider who clearly had the speed but just needed to come back a notch, like all fast guys have done over time. 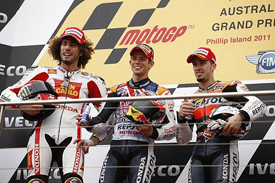 Valentino Rossi, Casey Stoner, Mick Doohan – to a man they all worked out how to stop crashing and then their championships came. Simoncelli and I used to have the odd chat away from the hustle and bustle of the press office attempted in his broken English and my broken Italian. I always found his comments straight and devoid of PR, perhaps thanks to his lack of perfect English. I arranged a one-on-one with him at Aragon only for the loss of the entire Friday afternoon's track action with electricity failure to scupper it. We never caught up on the record. Away from the media glare my memories of Simoncelli are a fantastically strong handshake and, of course, that mop of hair that he used to hide under a beanie. It wasn't a marketing ploy, but him just being himself. He was never a rebel to the Anthony Gobert extreme, but instead was a normal guy being true to himself and doing something he was rather good at on the world stage. You really did get the impression he'd do it for a tenth of the money, so long as he was having a laugh and racing prototype bikes at 215mph every other Sunday. Simoncelli still lived in Cattolica, in the province of Rimini, had his sister and father come to the races and be part of the very family atmosphere that is Team Gresini – which is also based not far from Misano. His helmet was designed by Aldo Drudi and painted by world famous artist Davide Innocenti – both of whom are based within earshot of that circuit. Simoncelli's friend Rossi would be only a 15km scooter ride away up in Tavullia, while Marco Melandri was a similar distance away in the other direction. Mattia Pasini was even closer. It is the heartland of the current crop of GP riders. Marco would do the Monza Rally with Rossi and Le Mans driver Dindo Capello after the season had come to a close – you can only imagine the fun they had. Indeed only a month ago he drove a full WRC Ford Fiesta with works driver Mikko Hirvonen, something I thought he was doing for fun until I saw all the sponsors' branded pictures. He was that kind of guy – he wanted to do anything motorsport. He 'got' racing through and through. Simoncelli wasn't flash in any way, still driving the silvery-blue BMW to the Italian races with a little red-and-white striped helmet and #58 sticker by the M3 badge. I thought that was cool. He used his M3 to the max too, donutting it in the Mugello paddock and parking it up unwashed next to some Porsche in the riders' special car park at Misano. 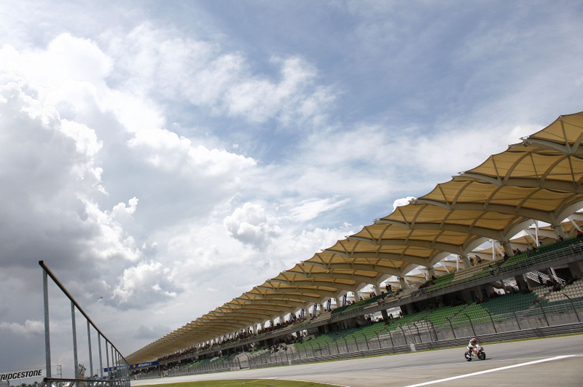 Coming off his best ever MotoGP result at Phillip Island last week, before this terrible Malaysian afternoon, things really were on the up for Marco. This was the last two races for these pesky little 800cc MotoGP bikes, and they were going to be a matter of course before they went back to Japan for ever. If ever a new-for-2012 1000cc bike was suited for anyone, it was for Marco Simoncelli. Back on the Adriatic coast one can only imagine what Fausto Gresini's close-knit team is going through. The last time something like this happened in the premier class it was the same outfit that was struck by tragedy. In that case it was Daijiro Kato, who was killed at Suzuka in 2003. At the very next race at Welkom in South Africa, Kato's team-mate Sete Gibernau won the race, pointing to the sky on the cooling down lap. There was not a dry eye in the place. How Valentino Rossi and Colin Edwards – the men who unavoidably collided with Simoncelli on Sunday – must feel after this is something one cannot imagine. Rossi was one of Simoncelli's best mates - one who texted Marco before he took part in one-off World Superbike wildcard ride on an Aprilia at Imola in 2009, urging him to beat Valentino's hated rival Max Biaggi. He did just that, much to Rossi's humour. The power of modern telecommunication is a wonderful thing, but in this instance we've had an appalling accident transmitted live on television. A death witnessed by millions. My Eurosport co-commentators Julian Ryder and Neil Spalding were working the race 'live' as is our custom, for when the programme is aired on its hourly delay. But as soon as we all saw the horror unfolding in front of us, our voices fell silent for it seemed obvious something terrible had happened. We just knew. The false rumours and inane chatter on Twitter gave us little hope. Then it became worldwide news. This just didn't happen in the old days, in a time when motorcycling mourned people from within our own world. What else can I say? I will hold memories of him getting stuck in at a nightclub in Estoril in his 125 days, 'pre-afro'; the BMW's worn out rear tyres; the way the hair would spring out from under that hat, the way he ran around Brno one Thursday evening; the stammering English that was so Italian; the massive legs sticking out as a Honda charged into the corners, his backside not really able to fit in the seat section because he was so tall; the way he said, "Ehhh, Ciao Tobbee". It goes on in my head, around and around. I cannot believe I've had to do this, especially for Marco Simoncelli.